300 Beale #408 is open this weekend. Listed for $1,350,000, this is an exceptionally large one-bedroom with den plus one-and-a-half-baths. It is open Saturday 1-3 and Sunday 2-4. The Embarcadero Lofts at 300 Beale has very little turnover. Out of the 53 units in the building, only 3 have sold in the past year. Upside: There is more new construction going on in this neighborhood than any other in the City right now. New luxury high rises abound, like the Lumina project just across the street. Proximity: 300 Beale is close by the water in a neighborhood that feels open and spacious in spite of being close to downtown. 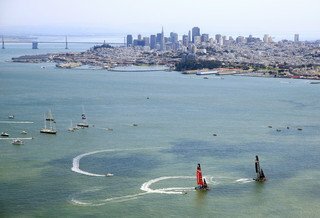 Location: You are walking distance to the Financial Center, the Ball Park, the Ferry Building and several fine restaurants. The Bay Bridge on-ramp is one block away. The freeways heading south are just two blocks further. 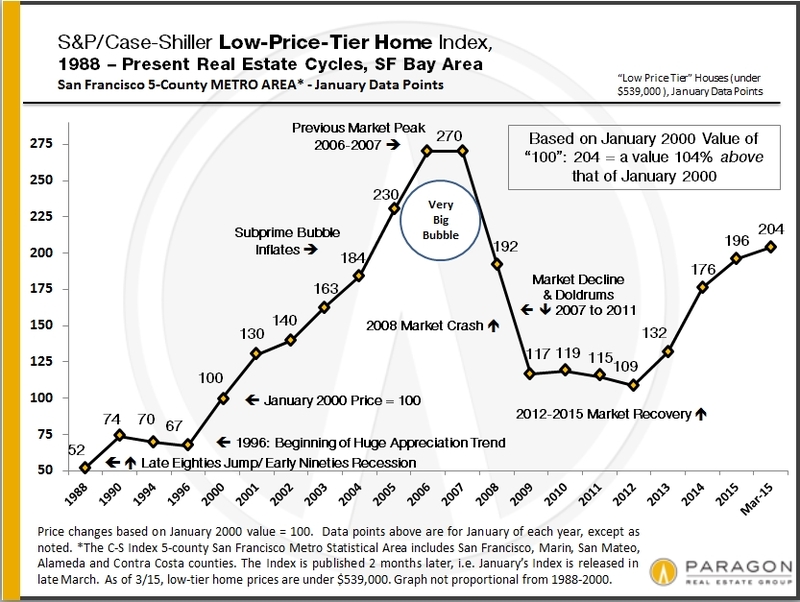 Investment Opportunity: San Francisco’s current median rent is $4500+. The units in this building would rent for more than that because they run larger than typical one- and two-bedroom floor plans. Unique: This is the only true adaptive reuse loft building in the immediate area. Listed in the US National Register of Historic Places, it is a former warehouse belonging to the Coffin Redington Company, a wholesale drug company. It was converted to condos in 1999. Floor Plans: The floor plans are practical, with doors to bedrooms that actually shut. No spiral staircases. No bathrooms on levels different from where you sleep. Finishings: Unusual polished hardwood floors. Exposed concrete walls. High ceilings. Distinctive mullioned windows. Elegant street presence: A landscaped courtyard with gated entry makes your guests feel like they have really arrived somewhere. The lobby is large enough to make a statement without being overly-showy. 300 Beale #408 is open Saturday, May 30 from 1-3 and Sunday, May 31 from 2-4— a rare opportunity to see the inside of a special loft building. These wise words about creating vignettes when staging a home come from Linda Betencourt of Center Stage in San Francisco. Stopping short of fake food and breakfast-in-bed trays, a few well-placed accessories can really give buyers the idea of how to use and enjoy a space. This wonderful free standing tub gets a bit of romance with an etagere of rolled towels, candles and fuzzy slippers at the ready. With the prospect of a relaxing soak, the brass hand shower and ceramic tile floor almost disappear. Remember to keep it current and uncluttered. Black and white photos on the walls give a nice contrast without distracting, white towels are always crisp visually, and silver accents add a much needed sparkle at the corner. The best vignettes are smart, sophisticated and suggestive, with accessories used to evoke a universal emotions. Others reflect the style of the home. A hipster loft will have a martini shaker and glasses set on a glass table top. A Victorian closet might have a few choice designer dresses stunningly hung on padded silk hangers. The objects used in vignettes usually have pleasing shapes and neutral colors. Leather bound books on end tables are a popular item, along with lovely bars of soap in the guest bath, a small carafe and glass at bedside, and an artfully tossed throw on the sofa. Splashes of color generally come from things like oranges or apples stacked in a glass bowl. I’ve also seen creative uses of food packaging to add color spots. Three big green bottles of Perrier brighten a white kitchen counter of a home for sale on 21st Street in Eureka Valley. I’ve even saw a small pyramid of Campbell’s tomato soup cans in a pantry flanked by bright blue boxes of DeCecco Pasta in a condo! Go creative or go home. 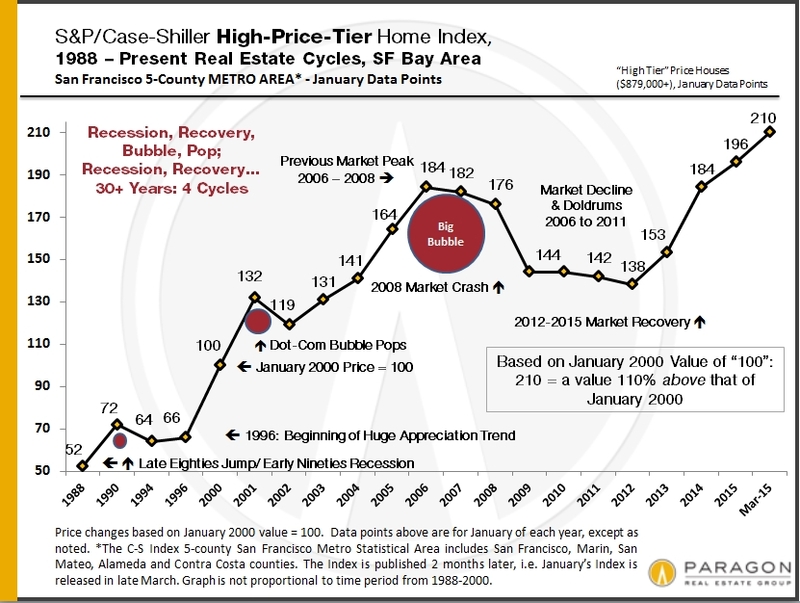 When people start to look at homes in San Francisco, they don’t always think about how many stairs they might have to climb just to get to the front door. Stairs aren’t that big a deal, you say? Tell that to me when you’re struggling to take out big bags of garbage, schlep groceries into the house from the car – or move heavy pieces of furniture in or out. Condos are a good example, particularly Victorian flats. On our regular Tuesday tour, sometimes I see as many as 20 a day. This week, just for fun, I started counting the number of stairs, curbside to the actual living space. 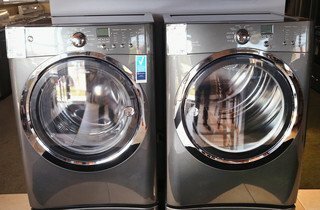 Here’s the typical breakdown: With condo flats, you usually have to walk up seven or eight steps to get to the front door, and then up a winder to get to your flat. If it’s a top-floor flat it can be a long journey, so if you’re thinking of taking the dog for a walk, you might want to make it a single long one rather than several short ones. I recently saw a beautiful Victorian condo flat and counted 43 stairs from the sidewalk. The next one I went was a little easier at 33 stairs including one from the threshold into the home. The third was a straight shot from the sidewalk into the house, but it’s built on a downslope on four levels. It’s 35 steps from the living room all the way down to the backyard. What a drag it is to do a barbecue or any outdoor entertaining – don’t drink too much beer or you’ll be dragging up to the bathroom far too often. Looking to step up your housing search? Get in touch. 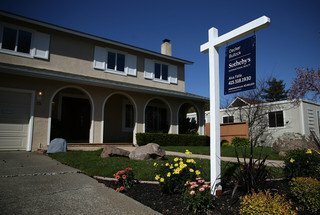 How can I write terrific real estate copy? Homes described as “beautiful” moved 15 percent faster and for 5 percent more in price than the benchmark. A home pitched as a “good value” sold for 5 percent less than average. Another dead-in-the-water phrase is “must see!” which had a statistically insignificant effect on the number of days homes took to sell. Good Value – Not much to look at but definitely a bargain. Handyman Special – Money pit. When I write about my listings, I try to help someone imagine living there. I also focus on the lifestyle a property offers and use words that will draw in the appropriate buyer — for example, copy for a SOMA loft should differ significantly from copy for a Noe Valley single family home. When moving into details, I like to augment my descriptions with language that helps a buyer picture the space. ”Big walls for art” and ”Rooms you can roller-skate in” are two examples of how words can affect a home buyer’s experience of the property. 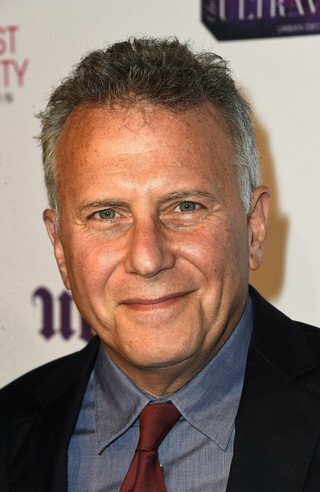 If you’ve watched any amount of television and movies over the last few decades, then you’re almost certainly no stranger to the stylings of Paul Reiser. This comedic icon’s film achievements include Whiplash, 6 Miranda Drive and the upcoming movie Concussion as well as the critically acclaimed NBC series Mad About You, which he co-created and in which he starred. Other credits include the FX series Married, the Steven Soderbergh-directed HBO movie Behind the Candelabra, and the highly acclaimed Sundance Film Festival Award winner Life After Beth. Born in 1957, the New York native is ranked 77th on Comedy Central’s 2004 list of the 100 Greatest Stand-Ups of All Time. He attended the East Side Hebrew Institute and graduated from Stuyvesant High School, earning a bachelor’s degree in piano and composition from Binghamton University in New York State. He cut his teeth as a stand-up comedian and then had a breakout role in 1982’s Diner, a film directed by Barry Levinson. This was followed by Reiser’s role as a detective in Beverly Hills Cop and then in its sequel, Beverly Hills Cop II. He also starred in James Cameron’s Alien’s, The Marrying Man and Bye Bye Love. Reiser will appear at Cobb’s Comedy Club on Saturday, May 30 beginning at 7:30 p.m. Tickets are $27.50 apiece. Cobb’s is located at 915 Columbus Avenue in San Francisco. All shows are 18 and over with valid photo identification and there is a two-drink minimum per person. Camera and video/audio recording devices are not allowed. 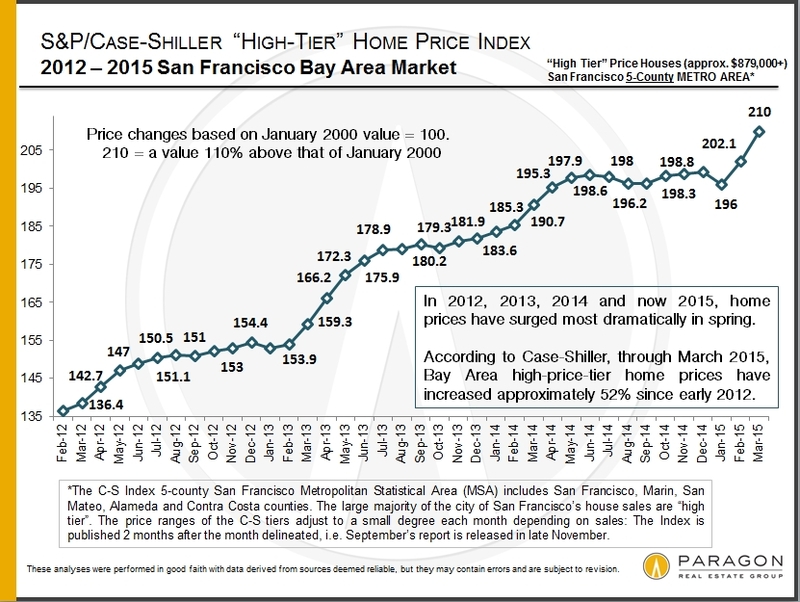 What is the per-district dollar sales volume in SF? 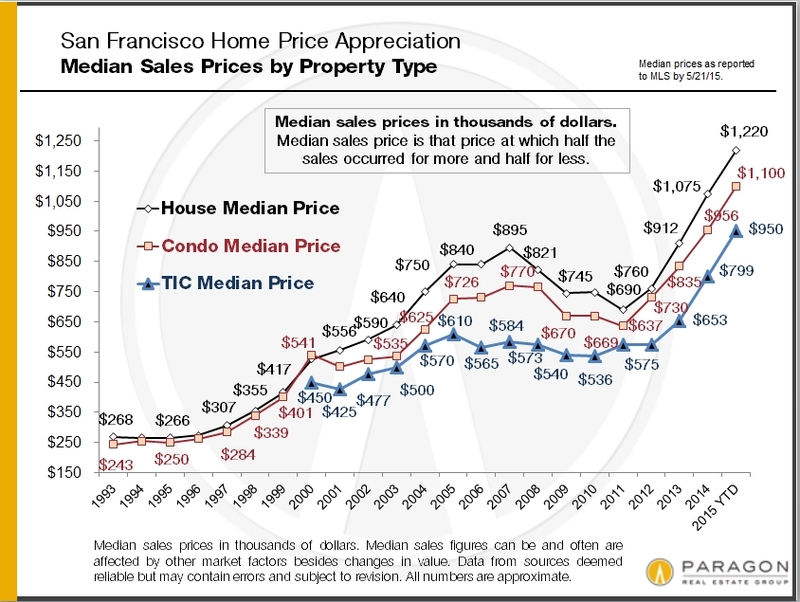 When thinking about your own piece of paradise in San Francisco, it’s helpful to understand per-district figures, particularly when it comes to sales volumes. That’s why we at Paragon have created a chart specifically for that purpose. Read on to learn more. We looked at the total dollar volume sales for 12 months of Multiple Listing Service property transactions in the residential sector. They are charted in terms of millions of dollars. 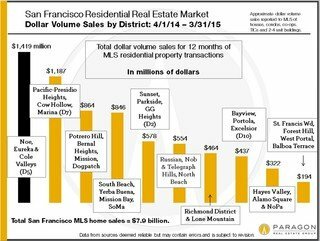 · Saint Francis Wood, Forest Hill, West Portal and Balboa Terrace averaged $194 million. 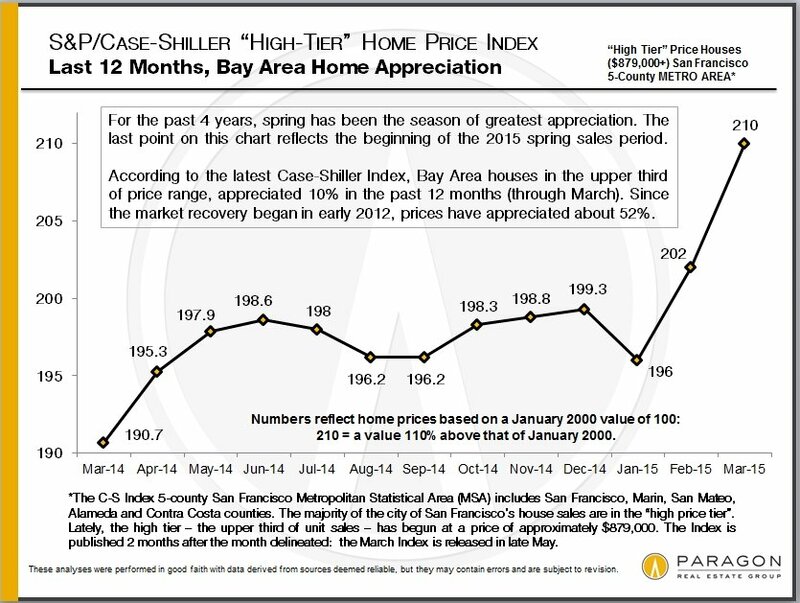 Total San Francisco Multiple Listing home sales during this period – April 1, 2014 to March 31, 2015 – were $7.9 billion. 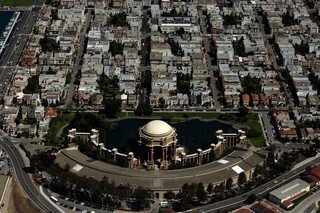 Pacific & Presidio Heights neighborhoods remain the City’s most expensive. These are the City’s most prestigious neighborhood, but also where you can find the really big houses and mansions, like 2610 Scott and 24 Presidio Terrace. For those priced out of the “Mansion Market”, the greater St. Francis Wood-Forest Hill area offers comparably large and elegant homes, like 11 Yerba Buena. 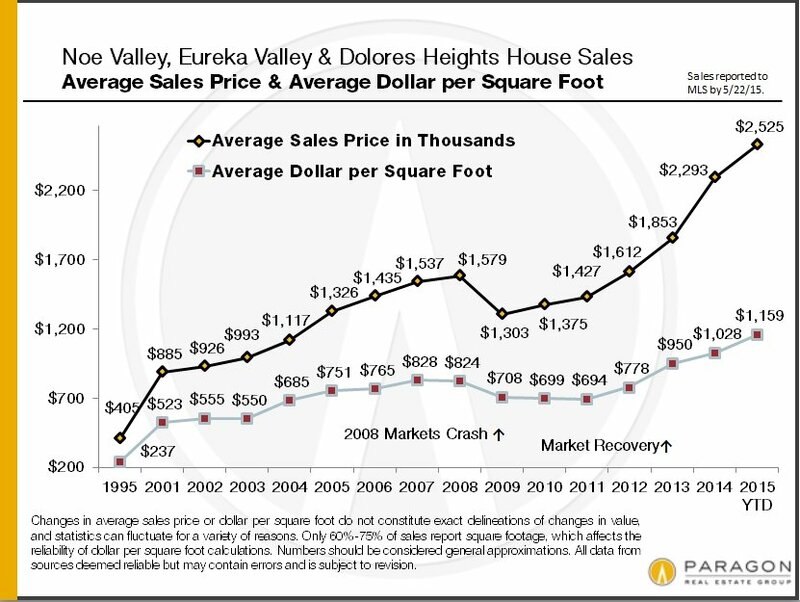 These homes are often on larger lots, at significantly lower dollar-per-square-foot prices. These buyers also often aim for the large, gracious, 3-5 bedroom Edwardians found in Inner/Central Richmond, like 136 3rd Avenue. 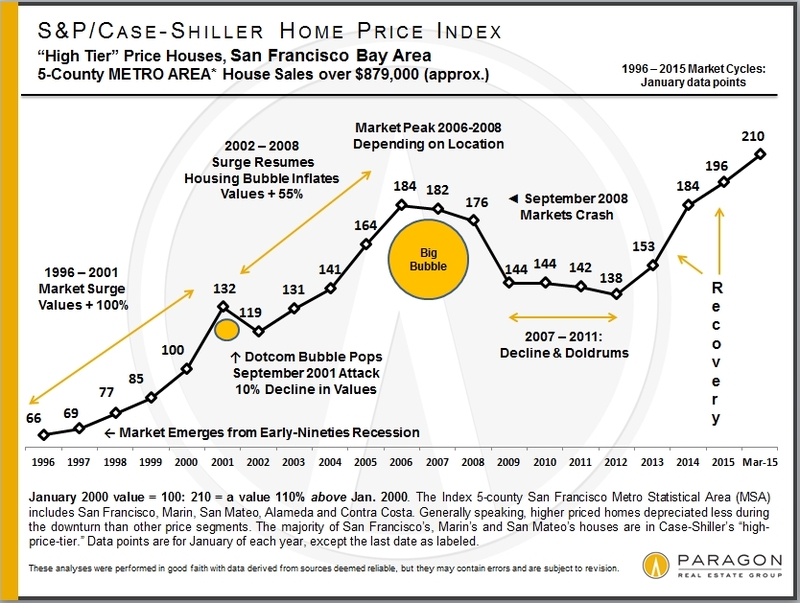 If they can handle slightly smaller square footage, Noe/Eureka/Cole Valleys also offer some nice single family homes. Examples of recent closings in these neighborhoods are 286 Jersey and 4746 17th Street. Today we are defining luxury homes as houses, condos, co-ops and TICs selling for $2,000,000 or more. According to the MLS, In the past 12 months 414 houses, 220 condos, 23 co-ops and 14 TICs sold above $2M. Of those 671 home sales, 56 houses, 7 condos, 3 co-ops, 1 TIC went for over $5M. Currently, the $2M+ market makes up 10% of residential sales. With the way things are going, this price point may seem low. Right now homes priced in the low $2M range might only get you a small fixer-upper house in one of our Northern neighborhoods. (3240 Lyon is one example.) $2M+ can get you a large gracious home in other neighborhoods, however (especially if you are ok with foggier weather). Read on for more details. . . The super luxury homes, selling for 5,000,000 and above constitute about 1% of the city’s home sales. 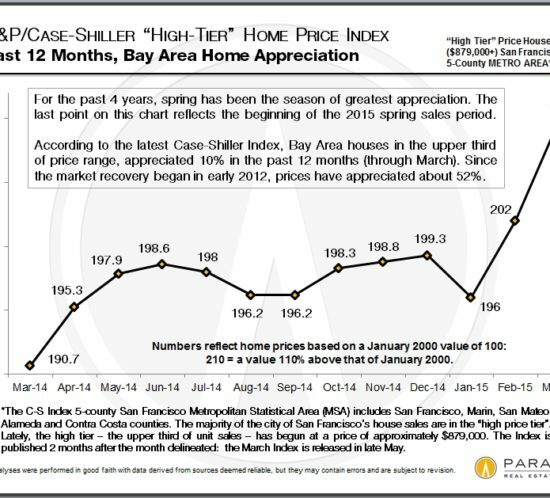 Houses and condos that recently closed in this price range are 614 Noe (which sold and closed in 11 days) 285 San Anselmo, (which took over a year to sell) and 1100 Sacramento #802. The most expensive house to sell in the MLS since the beginning of the year is 2701 Broadway, which closed May 15 for $31M. The most expensive condo is 1070 Green #1501, which closed for $6,875,000 on the same day.